Photographing newborns to three month old babies and their parents has been a fun new way for me to expand my photography services. I have had the good fortune of getting beautiful babies and their parents share some time with me and allow me to capture some of the first moments together outside the hospital. We set up a home studio in each location at the convenience of the parents so they can stay at home with their newborns vs going to an outside studio for portraits. We take breaks to allow for feeding, changing and naps as needed. 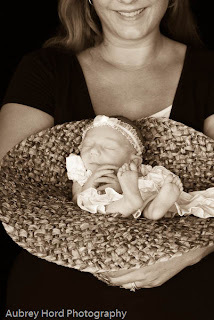 The newborn photo sessions are fun, meaningful and capture a very special time in the lives of new parents and their little ones. This part of the business has been such a joy to grow! I truly enjoy watching my youngest clients grow up! 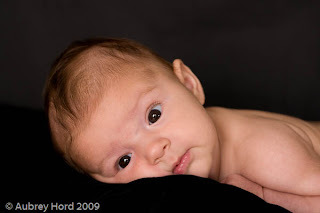 We do our best to capture the baby's developing personality as well as their tender relationship with their parents. 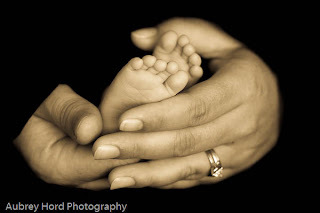 I never get tired of seeing the little feet in hands and the details like the mother's wedding ring in the image. We try and use one hand from the father, one hand from the mother and the baby's feet in the middle. It is a more challenging pose than you think! I am eternally grateful to everyone who has helped me build my business and share both time and space in their homes to host a home studio for the sessions. 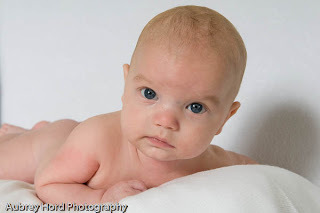 Newborn Tom was a blue eyed gem and a model baby to photograph. We photographed him first when he was 3 1/2 months old and able to push himself up. his blue eyes focused on the camera incredibly well and we had a great time laughing with him and his proud parents over the course of the 90 minute session. He is sure to be a male model! We are trying a few new poses as well, depending on the size of the newborn, the available props we have in stock and client props or clothing. 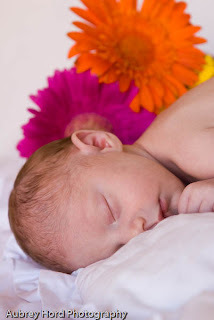 Hats are always fun on newborns as well as flowers, cute toys and blankets. I aim for simple imagery that allows the baby to be the focus of the shot and possibly a glimpse into what the future may hold for the baby if I am lucky. I am humbled you all like your images and am honored to have had the opportunity to meet your newest member of your families. Please call or email to inquire about pricing and to schedule a booking (808) 264-5226 aubrey@aubreyhord.com. Ashley and Chris are Expecting! Maui Portraits - Family Fun with the Kartsens! Maui Honeymoon Photographer - Gwen & Ray!